When I first heard about Wall-O-Water and Season Starter plant protectors my first thought was - "do they really work?" I live in Seattle which is a great test location because the recommended date for transplanting tomatoes in Seattle isn't until Mother's Day (2nd week of May). However, I'm impatient and I already had grown tomatoes from seed that were ready to be planted in mid-April. Besides, the plants were outgrowing both my seed starting stand and my garage. 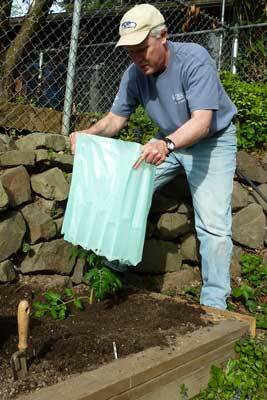 If you're not familiar with these plant protectors--they are a jacket of transparent flexible plastic water tubes (clear, green, or red depending on the manufacturer) that you place around warm-weather seedlings like tomatoes, peppers, or cucumbers to extend your growing season. 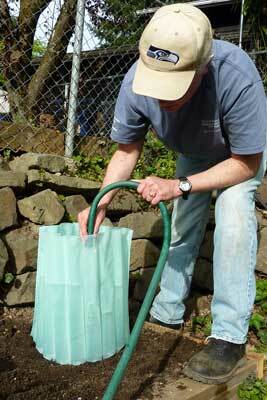 The claim is that you can transplant your tomatoes into the garden up to six weeks early using a water-filled plant protector. Generally the reports are very good. Gardeners in colder climates swear by them; I've heard reports of tomato plants coming through snowfalls unscathed inside these plant protectors. If there is a downside it's either that no difference is noted or that they fall over and damage the plants. So this year I'm trying them. Some gardeners report having a hard time wrestling with them while filling with water, but I didn't have any trouble filling three of them; it might be because I stood them on a flat concrete surface. Count back from your normal planting date four to six weeks. 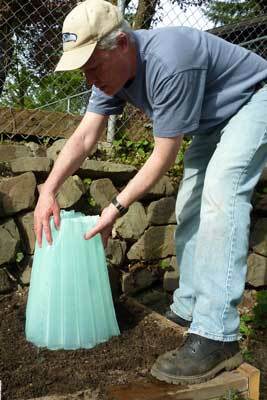 Plant your tomato seedling in the normal manner. Make sure the soil is reasonably firm and flat around the plant to provide a stable support. On a flat surface set up the the Wall-O-Water into a ring and begin filling the tubes until they are all about one-third full. Some people have found it's easiest to fill them by placing around a 5-gallon bucket. Set the Wall-O-Water over the plant and any plant support you may be putting in place like cages, stakes, or ladders. If you are planning to use the standard small tomato cage go ahead and push it into place inside the plant protector before adding more water while the plant protector is still maneuverable. Continue filling the Wall-O-Water with a hose until the water in the cells is about 3- or 4-inches from the top. The Season Starter brand pictured is a type where the cells don't run all the way to the top. The advantage is that when one cell is full it overflows into the adjacent cells so it's easy to even out the water without having to constantly move the hose around. Other brands may have a similar design. Push the top inward all around the plant to form a cozy teepee around the plant. Then go ahead and top off the cells by filling with water. 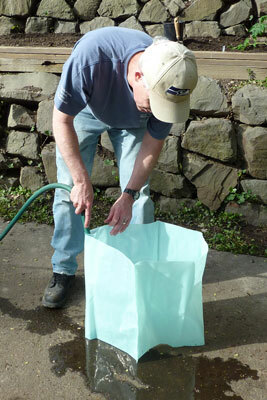 After the weather warms up most gardeners leave the Wall-O-Water in place for the rest of the season. They help moderate hot temperatures as well as extend your growing season a little. As the season rolls along you can continue to top off the cells with additional water from time-to-time. I think the effectiveness of these contraptions really depends on your local micro-climate. I'm sure they will help keep warm-weather plants warmer on cool nights. My conclusion after three weeks of use in a rainy Seattle April? A side-by-side comparison shows the plants inside the Wall-O-Water are healthier looking and definitely growing faster than my fully exposed tomato plants! So I am pretty optimistic about getting an earlier harvest from these plants.